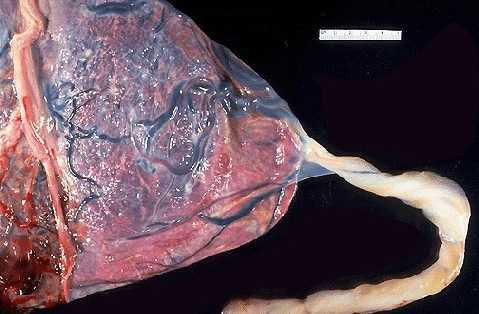 Normally, the blood vessels of the baby run from the middle of the placenta via the umbilical cord to the baby. Velamentous insertion means that the blood vessels, unprotected by Wharton's jelly, traverse the membranes before they come together into the umbilical cord. The umbilical cord inserts on the placental mass in about 99% of cases. The insertion site may vary from the center of the fetal surface to the border of the placenta. The term velamentous insertion is used to describe the condition in which the umbilical cord inserts on the chorioamniotic membranes rather than on the placental mass. Therefore, a variable segment of the umbilical vessels runs between the amnion and the chorion, losing the protection of the Wharton's jelly. The incidence of this condition is about 1.1% in singleton pregnancies and 8.7% in twin gestations. In twin pregnancies it is higher in monochorionic placentation or when the placentas are fused than when the placentas are non-fused. The incidence of velamentous insertion is even higher in early pregnancy; in spontaneous abortions it has been estimated to be 33% between the 9th and 12th weeks and 26% between the 13th and 16th weeks. The most significant clinical problem arising from a velamentous insertion of the umbilical cord is vasa previa, a dangerous condition in which the velamentous umbilical vessels traverse the fetal membranes in the lower uterine segment below the presenting part. In 6% of singleton pregnancies with a velamentous insertion, vasa previa is a coexisting condition. These unprotected vessels may rupture at any time during pregnancy, causing fetal exsanguination and death. Although spontaneous rupture has been reported before labor and with or without intact membranes, this accident occurs most often during amniotomy.